In the manufacturing process of Pharmaceutical, Chemical and Food & Beverage industries, the cleaning and sterilization of tanks and piping are done with various cleaning solutions, fresh or hot water and steam after manufacturing products. Clean- In-Place (CIP) is the system designed for automatic cleaning and disinfecting. 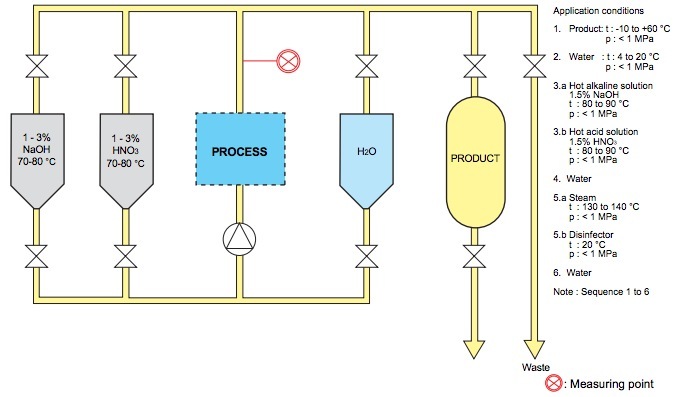 The recovery of cleaning solutions contributes significantly to reduce chemical costs and wastewater processing costs. Yokogawa FLXA21 inductive conductivity transmitter has earned a reputation in the recovery of cleaning solutions because it can take measurements with good boundary surface precision over a wide range. CIP systems depend on the process differentiations of Pharmaceutical, Chemical and Food & Beverage. In addition, the cleaning solutions and chemicals are different. The chemicals that are generally used are hypochlorous acid, caustic soda, and nitrous acid. In a cleaning solution recovery system, the process lines and piping are cleaned with an initial cleaning solution. After that, the cleaning solution is cleaned with fresh water. The cleaning solution is recovered at that point, but since it gradually becomes diluted with fresh water, recovery is discontinued and the solution is discharged through a drainage line when the concentration of the cleaning solution drops below the standard value. The cleaning with different solutions or fresh water, the recovery of the cleaning solution, and the discharge of waste solution are repeatedly carried out. In addition, sterilization with steam or cleaning with distilled water or de-ionized water is performed as a final step in some cases. Improved precision in boundary surface measurement. (b) One sensor can handle a minimum span of 100µS/cm and a maximum span of 1999 mS/cm.